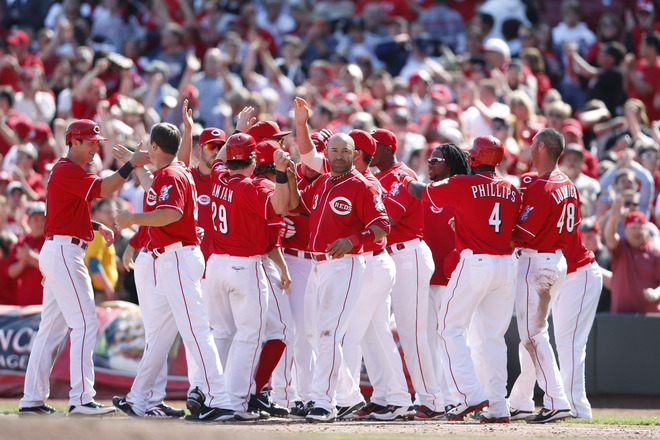 The Cincinnati took the rubber game of their first series of the year this afternoon by beating the Miami Marlins 5-6. Bronson Arroyo took the mound for the Reds and was downright good through six innings. Unfortunately, he pitched 6.1. At the end of his tenure, Arroyo allowed 5 runs (4 earned) on 10 hits and zero walks. Logan Ondrusek came in to finish up the seventh and he allowed no run, no hits, no nothin’. Aroldis Chapman brought in on home with the final two innings, surrendering zero runs on on hit and no walks. He also struck out 3. On the offensive side, the Reds struck early against a familiar face in Carlos Zambrano by scoring three in the first inning. That sounds like a lot, but they really should have scored more than that, having loaded the bases with either zero or one outs (I can’t remember exactly–I just remember being frustrated that they didn’t pad the score more at that point). It was enough, though, until that mess of a seventh inning when the Marlins found themselves in possession of a 5-4 lead. But then the hero of the day, Jay Bruce, came out in the ninth and smacked his second solo-shot of the day to tie it up at 5s. A few batters later, Scott Rolen knocked in the winning run with an infield hit to put a mark in the win column. Brandon Phillips also had a pretty good offensive game (2-for-4 with a run scored) as did Zack Cozart (1-for-4 with a walk, a run scored, and an RBI). Joey Votto did not have such a hot game (0-for-3 with a walk) but he picked a good one to sit out of, seeing as Bruce was all ready to do his thing. The win brings the Reds’ record to 2-1 (and Bruce is still on pace for 162 homers this season). Tomorrow the Reds host the Cardinals at 7:10 p.m. EDT. Homer Bailey will take on Jake Westbrook. Posted in Cincinnati Reds, Game Wrap, Random Ramblings.